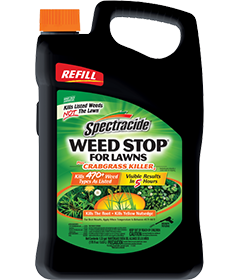 Use Spectracide Weed Stop For Lawns Plus Crabgrass Killer4 (AccuShot Refill) to kill over 470 types of weeds as listed, including crabgrass. The product produces visible results in 5 hours. This product kills broadleaf and troublesome grass weeds including dandelion, chickweed and clover as well as crabgrass, foxtail and yellow nutsedge, see product label for complete list of weed types. Apply when daytime temperatures are between 45°F and 90°F. Do not apply to Bermudagrass when daytime temperatures exceed 85°F. Isomer Specific by AOAC Method. Do not allow spray to drift onto desirable plants since injury may result. Do not apply as a fine mist because of potential for injury to desirable plants. Do not apply when windy. Do not treat when air temperatures exceed 90°F as damage to grass may occur. Do not use on lawns containing bentgrass, St. Augustinegrass, bahiagrass, centipedegrass or carpetgrass. Do not use on dichondra, lawns with desirable clovers or legumes, vegetables, fruits or ornamentals. Do not apply more than two applications per year. You must wait at least two weeks between applications. Do not apply directly to or near water, storm drains, gutters, sewers or drainage ditches. Do not apply within 25 ft of rivers, fish ponds, lakes, streams, reservoirs, marshes, estuaries, bays and oceans. To prevent product runoff, do not overwater the treated area(s) to the point of runoff or apply when raining or when rain is expected that day. Rinse applicator over lawn area only. Note: Application to Bermudagrass may cause temporary yellowing or discoloration, but full recovery can be expected. Do not apply to Bermudagrass when daytime temperatures exceed 90°F. Do not apply to zoysiagrass just emerging from dormancy, as it may result in lawn damage. Cool season turfgrass: Kentucky bluegrass; perennial ryegrass; fescue spp., including tall, red and fine leaf fescues. **Do not apply to zoysiagrass just emerging from dormancy, as it may result in lawn damage. ***Application to Bermudagrass may cause temporary yellowing or discoloration, but full recovery can be expected. Do not apply to Bermudagrass when daytime temperatures exceed 90°F. Apply when daytime temperatures are between 45°F and 90°F. FALL: Spray when broadleaf weeds are young and actively growing with adequate soil moisture for best results. Fall applications will control weeds that may otherwise go dormant through the winter and resprout the following spring. For heavy grass weed pressure, apply a second application at the same rate, 14 days after the first application. CRABGRASS (LARGE AND SMOOTH): Spring and early summer: For the best results, apply this product from crabgrass emergence until the six-leaf stage (two tillers) or before the crabgrass is 3 to 4 inches tall. This period begins the first time that you can see crabgrass in your lawn. Use two applications at the same rate with a 14-day interval for dense populations. Spring and early summer: For the best results, apply this product to foxtail during the early growth stages or when foxtail is 1 to 4 inches tall. Use two applications at the same rate with a 14-day interval for dense populations. Fall: Apply when henbit, chickweed, white clover, ground ivy, lawn burweed and other broadleaf weeds are young and actively growing with adequate soil moisture for best results. Visual symptoms and time to kill will depend on weed type, temperature and application rate. Twist nozzle completely to CLOSE position. Turn hose plug switch clockwise to “CLOSED”. Secure sprayer tip down in holster. Failure to adjust nozzle completely to CLOSE position and properly secure sprayer in holster may result in leakage and damage to property or injury to people or animals. Use screwdriver to open battery compartment. Remove used batteries and insert four new AA batteries in correct positions as marked per diagram inside of battery compartment. Never insert the positive end where the negative end belongs and vice versa. Always use a complete set of new batteries of the same type when replacing batteries. Never mix alkaline, carbon-zinc or rechargeable batteries. Securely close battery compartment door. Always follow manufacturer’s recommendations for use and disposal of batteries. Before each use, inspect sprayer carefully — make sure hose is flexible and not kinked, worn or cracked and that all connections are tight. Some hard-to-kill weeds may require re-treatment. Wait at least 30 days between applications — some weeds can take that long to die. If certain tough weeds are not dead within three weeks, repeat application to affected areas. Pesticide Disposal and Container Handling: Do not discard the AccuShot Sprayer. Keep the AccuShot Sprayer for use on Spectracide® Weed Stop® For Lawns Plus Crabgrass Killer4. Nonrefillable container. Do not reuse or refill this container. If empty: Place in trash or offer for recycling, if available. If partly filled: Call your local solid waste agency for disposal instructions. Never place unused product down any indoor or outdoor drain. CAUTION. Causes moderate eye irritation. Avoid contact with eyes or clothing. Harmful if swallowed. Wear long-sleeved shirt and long pants, shoes plus socks and waterproof gloves. Wear protective eyewear. Wash thoroughly with soap and water after handling and before eating, drinking, chewing gum, using tobacco or using the toilet. If in eyes: Hold eye open and rinse slowly and gently with water for 15-20 minutes. Remove contact lenses, if present, after the first 5 minutes, then continue rinsing eye. Call a Poison Control Center for treatment advice. This pesticide is toxic to fish and aquatic invertebrates. Drift and runoff may be hazardous to aquatic organisms in water adjacent to treated areas. To protect the environment, do not allow pesticide to enter or run off into storm drains, drainage ditches, gutters or surface waters. Applying this product in calm weather when rain is not predicted for the next 24 hours will help to ensure that wind or rain does not blow or wash pesticide off the treatment area.